Barn Light Australia is committed to excellence in online retailing. Customer satisfaction is an integral part of this commitment and this is reflected in our Returns Policy. We are not required to provide you with a copy of your original receipt to facilitate an exchange, refund, insurance or warranty claim unless required by law. Barn Light Australia will assess the condition and age of all Goods sold to be returned prior to offering a repair, exchange or refund. If the Goods are not faulty or has been damaged due to misuse, a repair, exchange or refund may be refused. This Return Policy does not exclude or replace your rights given under relevant consumer law or regulations. If we make a mistake on your order, we will correct the mistake and get you the correct products at no charge to you. We will arrange to pick up the incorrect items to be shipped back to our warehouse at no cost to you. It is our goal to exceed your expectations and ultimately your purchase. If you are unable to provide a valid receipt and/or 90 days has passed since the original purchase date, Barn Light Australia reserves the right not to offer an exchange or refund for change of mind. 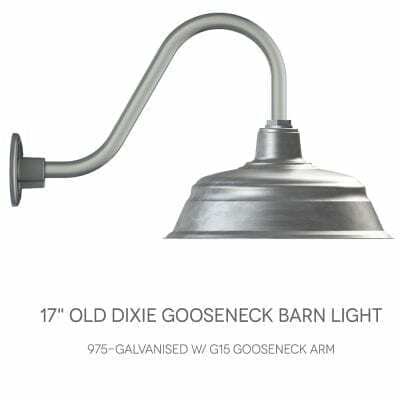 Barn Light Australia may, at its discretion, provide you with an exchange to the current value of the Goods. Please choose carefully when purchasing Bulky Goods as an exchange or refund may not be provided. 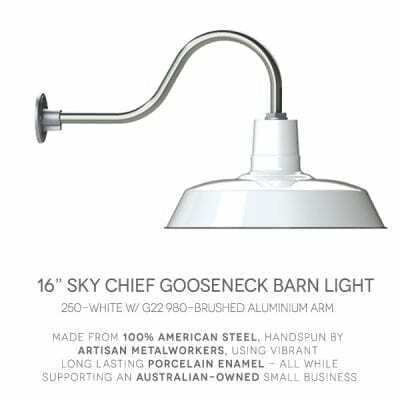 Barn Light Australia may, at its discretion, offer you an exchange or refund provided that the product is in saleable condition, unworn with all original packaging and stickers attached and the exchange or refund is sought within 90 days of purchase. Where Goods were purchased with a gift certificate or bonus Good, the gift certificate or bonus good must also be returned unless otherwise stated. If you are unable to return the gift or bonus or it is not in saleable condition, the value of a refund will be reduced by the value of the gift or bonus at retail prices. Where a bonus Gift certificate is issued at the time of purchase, the bonus Gift certificate credit must also be returned with the Goods to qualify for a full exchange or refund. Where the bonus Gift certificate has been fully or partially redeemed, the amount redeemed will be deducted from any refund. A Gift certificate is considered a valid receipt where the code is visible and can be used to make an exchange or return. This policy applies to all purchases made from Barn Light Australia. You will need to present or quote the Order Confirmation number (Emailed) and/or Gift certificate receipt number you received with the Goods to obtain an exchange or refund. Change of mind returns, as outlined above, must be requested within 90 days of the sale. When the Order Confirmation number is presented and a refund is to be given, it will be processed to the same credit card. In the event the credit-card has expired, we will require additional details depending on the preferred refund method requested. Barn Light Australia is committed to protecting your privacy. You may be asked to email photo identification so that we can record your name and verify your signature. Acceptable identification must also include your full name with a future expiry date. For example, Australian Driver’s Licence or Passport. Please note, when returning Goods totalling $1,000 or more and requesting a Tax Adjustment Note, your name, address and ABN (if applicable) will be required. Information collected will be securely stored for a reasonable period of time. It may be used for fraud protection activities and for the purpose of Barn Light Australia research and analysis. It may be disclosed to state and territory departments upon request, as required by law. If you wish to access a copy of your information held by Barn Light Australia, in relation to returns or otherwise, please contact our sales staff on (03) 8743 5500 or via sales@barnlight.com.au for further information. A RMA (Return Goods Authorisation) Number must be completed within sixty (60) days of despatch of the product. Returns must be received by Barn Light Australia within fourteen (14) days of the issued RMA date. Returns will incur a 15% restocking fee. The customer is responsible for ensuring the return shipment has paid insurance meeting or exceeding the original order value. The customer is responsible for all return shipping charges. Damaged Goods will not be refunded. Clearance, End-of-Line, Discounted or Customised Items are not eligible for return. International Orders will not be refunded. Commercial Orders valued over AU$3,000 will not be refunded. 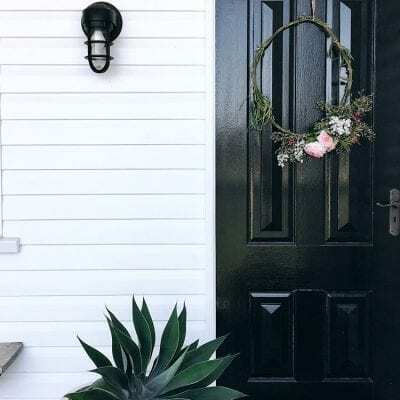 Barn Light Australia endeavours to ship Goods within fourty-eight (48) hours or reciept of payment, for this reason payments made via Credit-Card typically arrive within three working days of payment. An email was received AND/OR phone call/voice-mail is left within twenty-four (24) hours of ordering. In the event of order placement after Friday 5pm or during the weekend, within (36) hours from ordering. There is reasonable and justifiable cause to demonstrate why the penalty should not apply. i.e. The customer mistakenly added additional units from a prior shopping session mistakenly. We are human! The cost of returning shipment to Barn Light Australia. the cost of shipment insurance meeting or exceeding the original order value. Barn Light Australia offers an automated RGA (Return Goods Authorization) portal, available 375 days per year. In order to access the RGA portal, please follow the following steps. Click on ‘My Account’ on the top-right of this screen. Fill out the information available on that page. Affix the RMA number to the box/parcel, close to the new shipping label. When shipping the box/parcel ensure that(a) The Goods are packaged securely, and where possible, with the original packaging material. (b) Full insurance is reflected within the shipping cost. (c) A Tracking number is made available as part of the shipment. Email sales@barnlight.com.au the tracking number for our reference. Please wait until we have received your box/parcel for a response, please refer to Returns (clause 9) for further information.